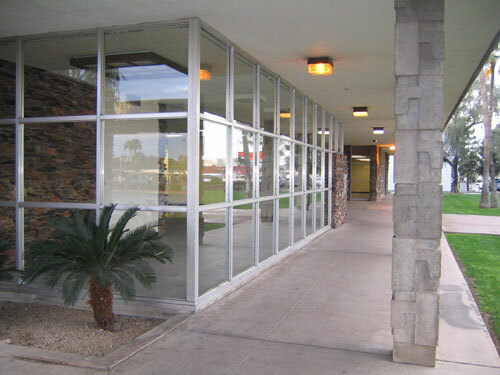 In 2005 the Engineering firm of Hoskin Ryan Consultants acquired the title to the Valley National Bank Building at 2nd Avenue and Indian School Road. Bringing the building back to its original glory and adapting its use for a contemporary engineering studio was a task that Hoskin Ryan Consultants and Jack Black of OWP/P took very seriously. In this exclusive interview with Modern Phoenix LLC, the design team reveals the process behind their landmark Midcentury Modern rehabilitation. The result stands testimony to the fact that rehab of unique and challenging Midcentury Modern spaces can be done sensitively and creatively. 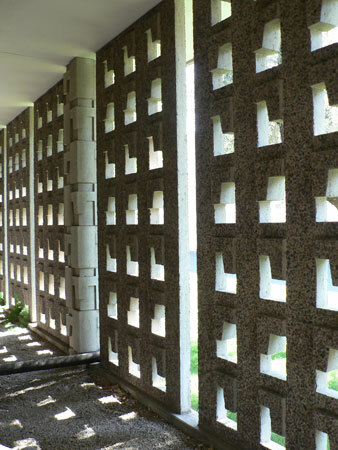 What is your take on local architecture of the 50s and 60s? Paul: Phoenix does not have the diversity and age of historic buildings that many other cities in the U.S. have. It is important to maintain our history, and so much of the old is being torn down and replaced with the vanilla buildings of today. We think it is important to preserve this heritage. Fortunately, architecture from this period is now en vogue and there is a greater emphasis on its preservation. How did the 2nd Avenue building come to your attention? Paul: The firm was previously located in a modern building located near 3rd Avenue and Roosevelt St. This location was selected because of its convenience and because it falls within an in-fill and re-development area. That location served the firm well from the end of 1999 until February of 2004. Tom Ryan and I, the firm's principals, are firm believers in the development of in-fill properties so as to reduce commute distances and minimize urban sprawl. Prior to our move into 201 W. Indian School Road, the firm resided in leased space at 3003 N. Central Avenue on the 15th floor. The decision to move into a high rise building occurred at a time when high rise buildings have fallen out of favor and the decision was based upon economic considerations, convenient central location and the inability to find a property which met our space and aesthetic needs. Since our office was located in the vicinity, this building quickly came to our attention. At first, the building was for lease. Since the principals wanted to renovate an older building, leasing did not fit into our plan. Once the building became available for purchase, we made an offer immediately. The architectural style is reminiscent of Frank Lloyd Wright and we felt that the modern architecture would blend well with our business model. The site location is convenient and will have easy access to the light rail once that is completed. How did you know that it would be a perfect fit for you? Paul: The firm has moved several times since its inception; each time to a larger facility. We believe that the firm has a great opportunity for growth over the next few years. As the firm looked for an office, our space needs continued to grow. We wanted a convenient central location, enough space to grow to at least double our current size, and enough land area for parking and to create a garden like office. We feel that we have achieved these objectives at this location. How does the entire look and feel of the space reflect the mission and values of Hoskin Ryan Consultants? Paul: Our slogan is Creative Engineering Solutions. We wanted a space which is unique and represents this. We feel that the architect has done a tremendous job in creating a unique blend of modern architecture and at the same time preserving elements of the original structure. We have been able to create an office which is an open plan, accepts natural light through the use of glass and skylights, and which also provides opportunities for employees to relax when not at their desks. 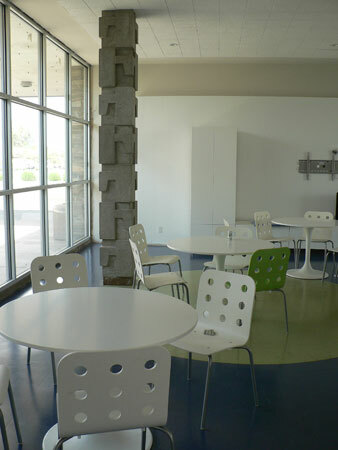 The break room and outside areas that are planned will provide many opportunities for employees to get together and communicate outside of their workstations. 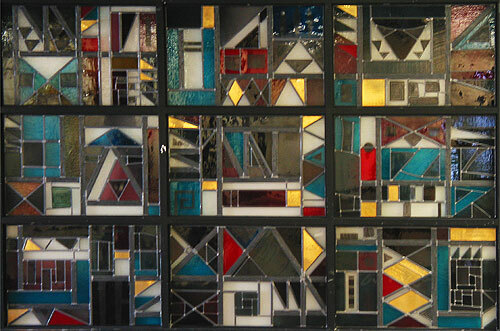 Did you actively seek out a Midcentury Modern building that needed to be rehabbed, or was it a happy accident? 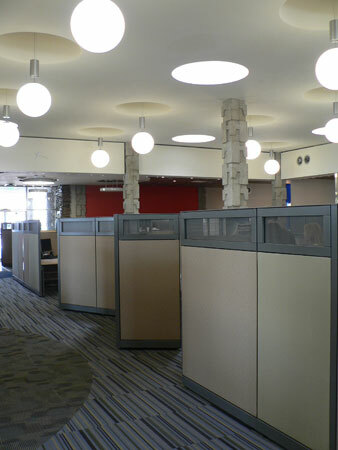 Paul: We were actively looking for office space of sufficient size that would meet our needs. Certainly we were looking for a building that needed a renovation since that is an important part of the process and gives us the opportunity to be creative. Given the available office market, we were open as to the building style. We did originally consider the Gould Evans Building on 3 rd Ave. which also is of the same era. What are the features of the property that most attracted your team? Paul: We really like the architecture, the single level, easy access, ample parking, stone facings, large landscape areas and high ceilings. Most importantly, incredible amounts of natural light is brought in through the floor to ceiling glass curtain walls that surround the building. 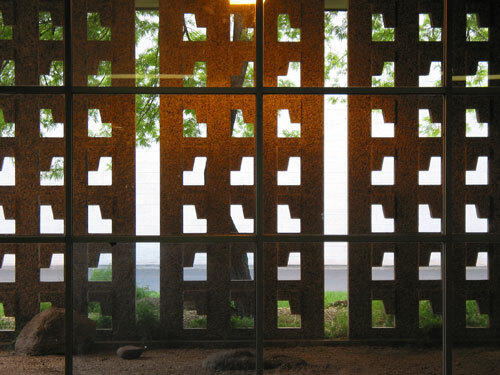 Which features of the building are in your eyes quintessentially Arizona Modern? 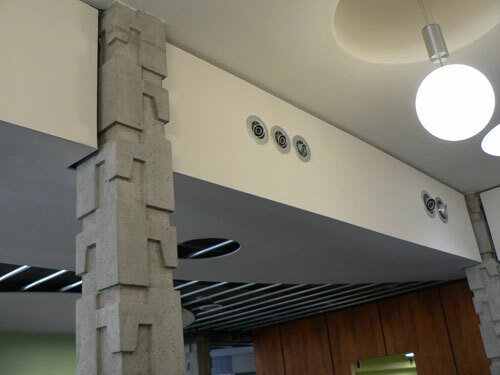 Paul: This building represents typical 60's bank architecture. Flat roofs, divided pane windows, concrete clad columns and façade are all features that capture the modern essence. Jack: The building is a classic Midcentury Modern structure in that the roof is a flat floating plane and the extended arcade is part of this design strategy. The building is a collage of planar elements in various materials collected under this roof, i.e. the window grid and the rectilinear planes of stone against the datum of the arcade. What challenges lay in the rehabbing of the building? What "creative engineering solutions" did you need to address? Paul: Schedule was a big issue. The building was acquired in June 2005. It was our desire to move in by the end of the year because our lease was due to expire. The time to put concepts together, complete design drawings and obtain city approval hampered our efforts to move in by the end of the year. Design plans illustrated the concept but not all of the design details, therefore, the design evolved during the process. This further contributed to delays as decisions needed to be reached. Other unknowns during the initial stages of construction included the unknown elements which are commonly associated with a re-model project. The depth of the sewer at the guest bathrooms was unknown and we found out it was quite shallow. This limited opportunities for providing restroom access to the west side of the building. How did you come to select Jack Black of OWP/P as the principal architect behind the rehab? What is his previous experience with this sort of project? What was the process of updating the space like? Paul: Jack has been a personal friend of mine for over 10 years. 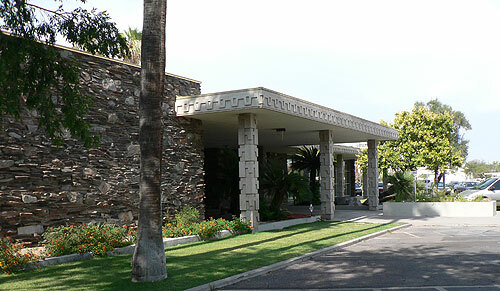 It was discovered during the purchase discussions that Jack was familiar with the building since his firm, OWP/P, had also considered its purchase. Jack is very much a modern style architect so his selection for the project was a natural. What history and urban lore did you inherit with the building? 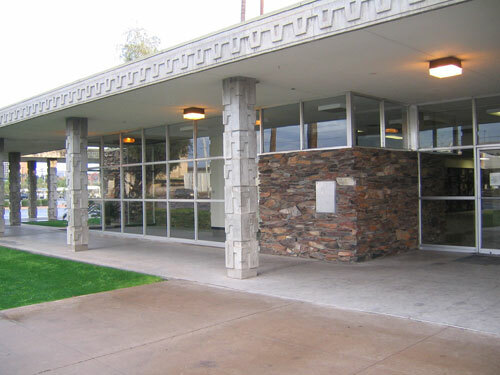 Paul: The building is one of several survivors of branch banks that are very cool and specific to modern design adapted to the southwest. 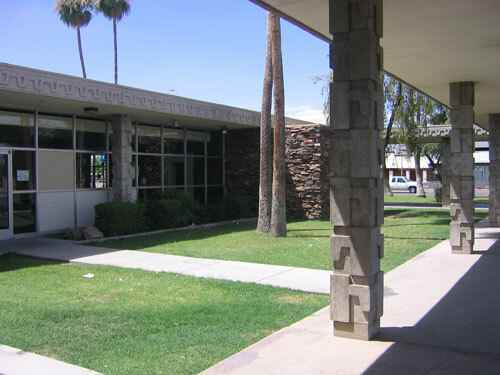 For example the 44th and Camelback Road, 2nd Street and Willetta Road, and the 16th Street and Camelback Road bank branches. We have a portion of the original architectural drawings for the building. The mechanical room in the basement is in its original condition. 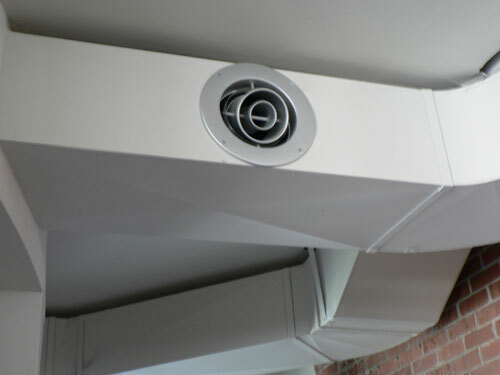 What hidden secrets did you discover during the remodel? Are there any unsolved mysteries? 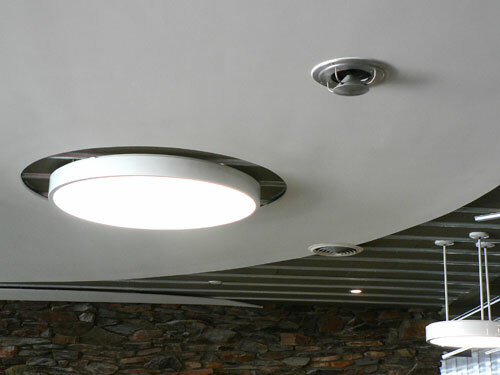 Paul: The original skylighted ceiling was covered by a more contemporary gridded drop ceiling. Originally the building had a total of 24 skylights set in a plastered ceiling. As a part of the remodel, we uncovered the ceiling, exposed the light wells and restored 8 of the 24 skylights. Jack: This was the coolest part of the renovation - the circles from these skylights inspired the rest of the circular elements of the new design. What is the landscape program for this property? What retro aspects will be retained, and what contemporary touches will be added? Russ: The original design of the landscape for the building was a textbook example of landscape design for the late modern building. Strong tall verticals in the form of palms played off the long, clean, sleek horizontals of the building. Small groupings of olive trees and Chinese elms then were planted in tight groups to give respect to the open space a lavish lawn, and to keep the views of the building elevations exposed. Close up to the building, rectangular planters had bold pedestrian scale accent plants such as Mediterranean fan palms and sago palms in clean panels of ground cover that could be enjoyed up close as the customer entered the building. 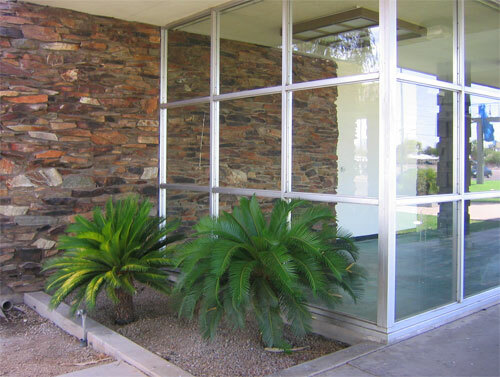 Lastly, a few smaller scale accent trees such as Bottlebrush were installed against panels of rock to play the color and vegetation texture against the roughness of the rock building walls. A decision was made by the principals to keep the original design intent of the original landscape design. 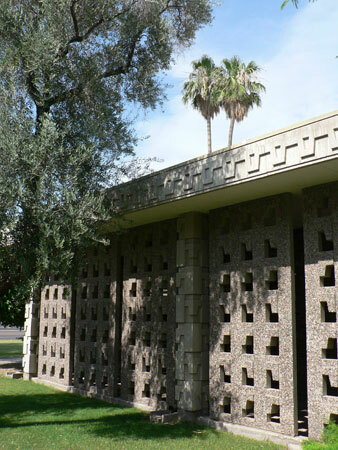 As you may have noticed in driving around Phoenix, there are some distinct styles that are now current in the way plants are used and arranged. The lawns will remain because we feel that this it is one of the main components that makes this building what it is. Being a landscape architect now in the valley going on thirteen years, I know this flies in the face of current practice to exorcise all lawns whenever possible. My belief though is that the lawns themselves help make the building what is, and need to remain. I just cannot imagine this building sitting in a sea of decomposed granite, with the requisite planting of drifts of desert plants and hot voids. Two areas will be added to the building in the form of outdoor patios. One enclosed patio to the north of the employee lounge wall will be for employees to sit and have lunch, but will also serve as a quiet area that when finished, will have an urban garden feel with a water feature, that will be long and linear to play off the architectures lines. The other enclosed patio will be to the south, will have the same feel and be more for group gatherings. When both are in place, the uninterrupted view through the glass curtain walls on the north and south of the employee lounge will make the entire space open and airy. The rest of the landscape design intent is to keep as close as possible to the clean, cool simplicity of the original landscape design. Adjustments to get our parking lot into shape aside, the landscape for the building will remain in place, and be augmented with small additions that bring the design back to be true to the spaces of sleek, planting beds and bold accents that were prevalent in the era the building was designed. Describe your plans for making the building a community resource. Dorina: We look forward to opening our doors to the public beginning this fall for First Fridays. 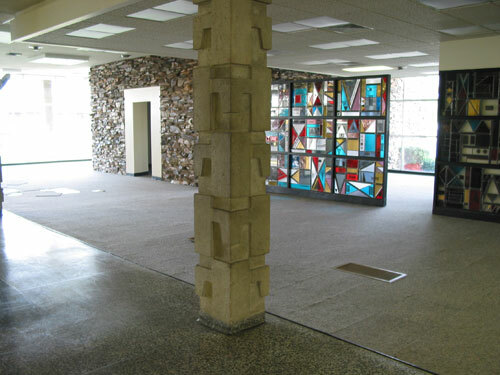 This building is the perfect exhibition space to present the type of work that is of our interest. These exhibitions will be carefully curated so as to establish a high standard of design excellence. The principals feel very strongly about bringing the community into HRC. This building is the perfect place to facilitate dialogue on topics related to and of civil engineering and land development. This is why we will certainly welcome requests for building tours of our progressive office space. Another service to the community that we offer is the opportunity to utilize the property for entertainment production purposes. We have recently registered with the Arizona Film Commission and Phoenix Film office as a location for television, commercial, film and editorial production projects.